Try out new Google Wave wave notifications! We know that one painpoint for people using Google Wave is that sometimes they don't know when others are trying to wave with them or whether anyone has responded to their waves. In designing notifications, we realized that people use lots of different tools on the web, but one system that is compatible with everyone is the physical world. 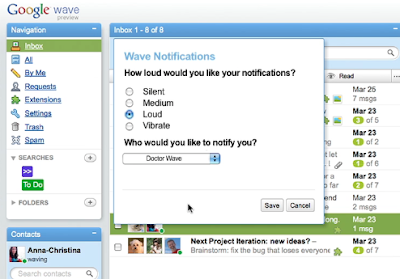 So, today we are excited to roll out an early preview of Google Wave wave notifications. You can enable Google Wave wave notifications through the drop down menu that appears when you mouse over the Inbox link in the Navigation panel. You can set the volume for your notifications to Silent, Medium, Loud or Vibrate and pick your preferred notifier. We look forward to offering more advanced options like black-out hours, vacation mode and personalized, downloadable wavetones. Genuine greetings may be confused for notifications. We are working on clearer signals to disambiguate these situations, but when in doubt we recommend you check your Google Wave inbox. We look forward to adding more types of Google Wave wave notifications, but want to hear how it's working for you, so please give us feedback.